Last Sunday we heard our Lord’s parable about the Sower who sowed seed in the hope that it would all take root and grow and produce an abundant harvest. Some did and some didn’t. On this ‘feast day’ of St. Mary Magdalene, we give thanks to the Sower for the rich harvest of saving faith that His seed/word produced in this humble and beautiful woman. Between the four gospels, there’s enough written about Mary Magdalene for us to put together a rather complete sketch of this woman. 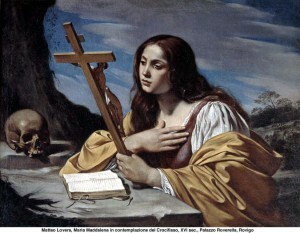 But “MARY MAGDALENE is NOT known by her relationship to another person, only by her hometown – ‘Magdala’ – which probably means that there was no husband or brother or sister or certainly child in her life. And maybe the reason for that has to do with THE CONDITION OF HER LIFE before Jesus. SO, WHAT DOES IT MEAN THAT JESUS CAST OUT SEVEN DEMONS FROM MARY? These days, we’re not too sure what to make of this whole business of ‘demons’ and ‘demon possession.’ So, it might be helpful to think of it like this. Without denying the existence of ‘demons’ and ‘demon possession,’ I think we can also say that with the help of modern science, we may understand some of the things differently than people used to. For instance, some of the ways that the bible describe the way that ‘demon-possessed’ people behaved, looks an awful lot like what we might today attribute to ‘seizures’ due to ‘neurological’ or ‘chemical’ disorders. What’s true NO MATTER HOW YOU DEFINE IT is the fact that the person who suffers from these things is like a ‘CAPTIVE’ who is unable to escape. They neither choose to act like this, nor can they simply ‘SNAP OUT OF IT.’ Mary was a CAPTIVE to these terrible forces. They CONTROLLED her. When Luke says that MARY had ‘SEVEN DEMONS,’ he may be using the bible number for completeness in order to say that Mary was ‘COMPLETELY’ under the control of these forces such that there may hardly have been any relief. Anyone who had known her before these “SEVEN DEMONS” would have said something like, ‘THIS ISN’T THE REAL MARY’ – like we might say of someone with advanced Alzheimer’s disease – “this is not who she really is.” THE REAL MARY was lost in the confusion and chaos of forces that held her captive. But then this man named Jesus set her free. We’re not told how. In his 4th chapter, Luke tells us that after Jesus healed Peter’s mother-in-law of her fever, a great line of people gathered outside the house. “All those who had any who were sick with various diseases brought them to him and he laid his hands on every one of them and healed them. AND DEMONS ALSO CAME OUT OF MANY, CRYING, ‘You are the son of God!’” (Luke 4:40-41). This took place in the village of Capernaum, which is very close by the little village of Magdala. Maybe Mary was one of them. In any case, by His command or the touch of his hand, HE SHATTERED HER DARKNESS. He unloosed the chains that bound her and the prison door flew open and she walked out HERSELF AGAIN. HE GAVE MARY BACK TO HERSELF and to her family and friends. The prophet Isaiah foretold that when the Messiah came, He would “open the eyes of the blind and bring out the prisoners from the dungeon, those who sit in darkness.” (Is. 42:7) Mary of Magdala was one of those prisoners. And however you might imagine it for Mary, I think it’s the way that we should think about what happens in holy baptism. We were all captive to sin and death and the devil and we could not free ourselves. None of us were OURSELVES – the people whom God created us in His image to be. But then, with the Water and His Word – Jesus set us free. He gave us back to ourselves again. We know who we are now – children of God. “I will extol you, O LORD, for you have drawn me up and have not let my foes rejoice over me. O LORD, you have brought up my soul from Sheol; you restored me to life from among those who go down to the pit.” They could also be our own prayer of thanks for what Jesus has done for us in our baptism. Instead of returning to Magdala, Mary follows Jesus and becomes one of His most loyal supporters. As she followed her Lord, she would have seen Him set free countless others from their demons. Everywhere she goes she sees the darkness being shattered by the Light of the World. She sees those who were ‘lost’ – ‘lost to themselves and to others,’ – found and returned both to themselves and to others. Now we want to ask ourselves another question. What must this have been like for Mary? What was she thinking? What was going through her mind when, as Mark records, “when the 6th hour had come, there was darkness over the whole land until the ninth hour”? (Mark 15:33). The One who had set her free from her darkness and captivity was now engulfed in darkness and unable to escape His captivity. Had the darkness overcome the light after all? There are two things that we want to notice here. FIRST, Mary does not return to the captivity that she was held by before Jesus released her. We don’t see Mary ‘loosing herself’ again in the face of such confusion and chaos and darkness. SECOND, what we do see is that Mary simply remains at the cross. She remains right there through the three hours of darkness AND the earthquake that immediately followed His death. What is it that keeps her there? What else could it be but HER DEVOTION to Jesus. He had entered into her darkness and delivered her from it. Now, she was entering into His darkness. And even though she had no power to deliver Him from it, she could sit with Him. In her total hopelessness and despair, all she could do was to stay with Jesus. And that is what she did. Maybe we have had children or parents or friends who have been sick or friends and loved ones engulfed in grief and there was nothing we could do to deliver them from their darkness. All we could do was to sit with them in their helplessness and hopelessness. What insult on top of injury this must have been for her. Now she doesn’t even have a body to remain and sit with. Without even looking inside, she runs off to tell the disciples of the terrible news. Peter and John race to the tomb and confirm her worst suspicions – the body of Jesus they did not see. Because it’s not a matter of Jesus calling us to come out of the darkness and set ourselves free. WE ARE ‘PRISONERS.’ He must come into the darkness and ‘release us’ from its grip and SET US FREE. This is the great mystery of the Christian faith – God did not overcome the darkness by waving a magic wand or speaking into the darkness as He did at the CREATION of the world. He sent His Son to enter into it. The Son of God became as engulfed by the darkness and captivity of the devil as Mary was and as we all were. BUT MARY KNOWS NONE OF THIS AS YET. All she wants to do is be with HER LORD in His darkness which is also now hers. “Mary turned and said to him in Aramaic, ‘Rabbonni!” Which means MY TEACHER. And suddenly, the darkness was shattered – once, for all. The risen Son turned her tears into rainbows. And once again, Jesus gave Mary back to herself – and to His Father in heaven – never to be lost again.